It was early today, about 4 am (GMT), when Francisco appeared on the horizon near to Cabo Raso (Cascais). Looking forward to support him from land, were about fifty people, including family, friends and fans of this challenging adventure. 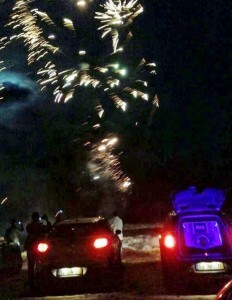 With the support of the MINI, Francisco was welcomed with fireworks and thanks to Polícia Marítima it was established a radio communication with Francisco himself. He thanked all the support and incentive from everyone. At this time Francisco is passing by Sines, very, very close to beating the World Record. All FB messages are transmitted to Francisco by his boat support crew and the incentives from everyone are extremely welcome!